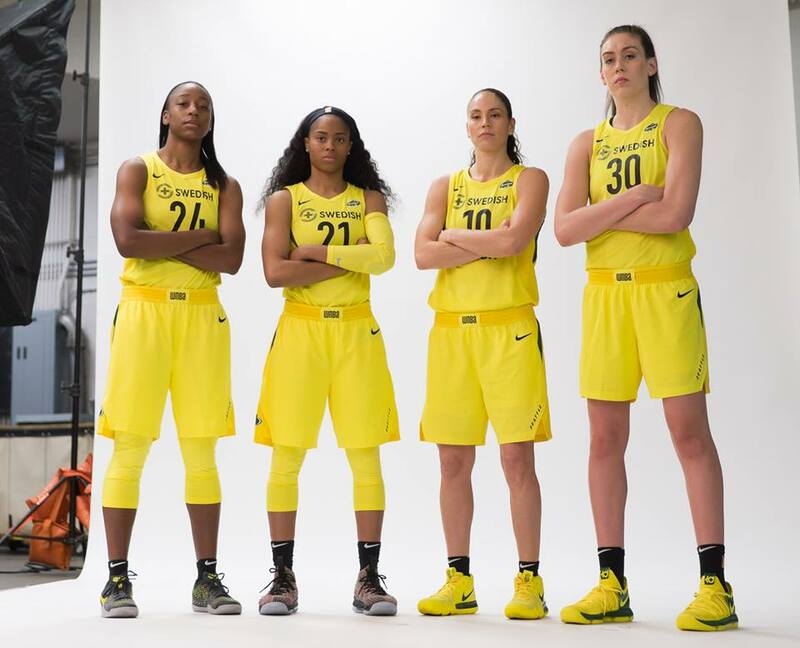 Jewell Loyd, Jordin Canada, Sue Bird and Breanna Stewart. Neil Enns/Storm Photos. 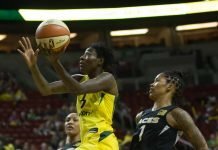 It’s been six years since the Seattle Storm won a playoff game. It’s been seven since the franchise finished the season above .500. 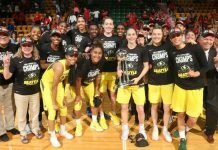 It’s been eight since Sue Bird last hoisted the WNBA Championship trophy; the lone remaining member from that team to the present squad. While it may be a big ask for the team to end its title drought in 2018 — the oddsmakers put their chances around 25-to-1 — many are hoping that this is the year Seattle at least makes a deep postseason run. There are certainly reasons for optimism as the season gets underway Sunday at KeyArena against Phoenix. Besides new leadership on the bench in Hughes, who is the league’s most winning coach, the team boasts an influx of talent in the post, and in a long-awaited point guard for the future. So, as go those additions, so will the Storm go in 2018. While the starting lineup has been a model of consistency over the last two years, with less than a dozen games missed between Bird, Jewell Loyd, Breanna Stewart, Alysha Clark, and Crystal Langhorne, bench production has often been hard to come by. 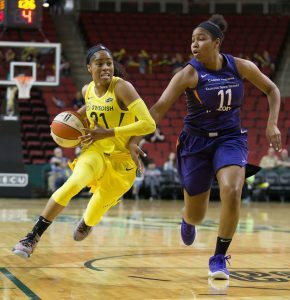 To that end, the team added significant depth down low in the offseason, signing two-time league rebounding leader Courtney Paris and trading with Minnesota for super-reserve forward Natasha Howard, who helped the Lynx win a championship last year. The hope is that both can play significant minutes and improve a unit that finished next-to-last in rebounding and dead-last on the offensive glass last season. Seattle opted to further shore up the post with its final roster spot, keeping third-round draft pick Teana Muldrow after an impressive preseason showing. The forward out of West Virginia was called “one of the surprises of camp,” by Hughes, and was one of the Big 12’s top scorers and rebounders in both her junior and senior seasons. Jordin Canada blazes by her defender. Neil Enns/Storm Photos. 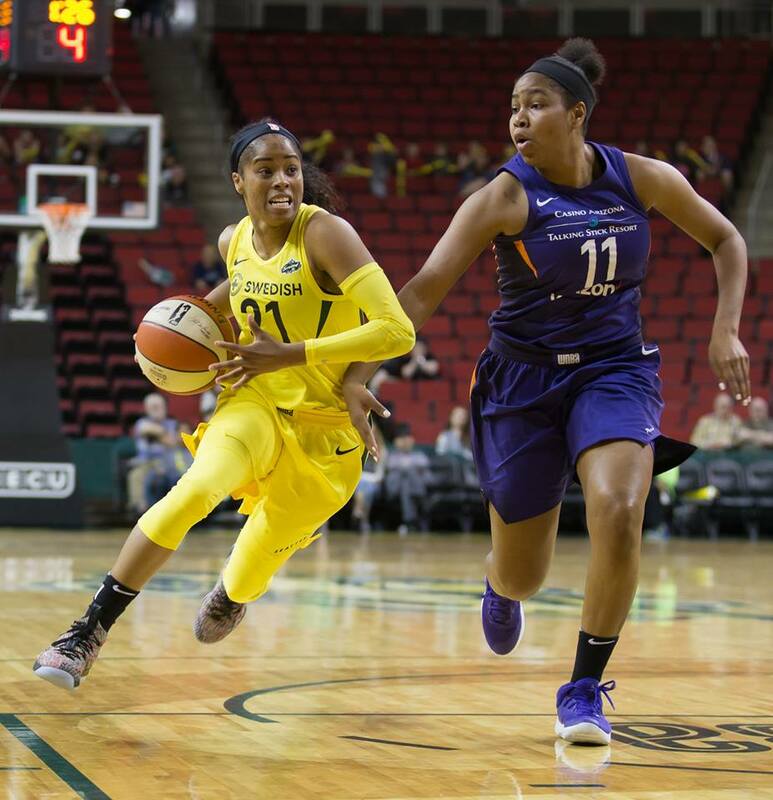 But the Storm may have made its biggest acquisition with its first-round draft selection, tabbing UCLA star point guard Jordin Canada as the heir apparent to Bird, who is the WNBA’s all-time assists leader. 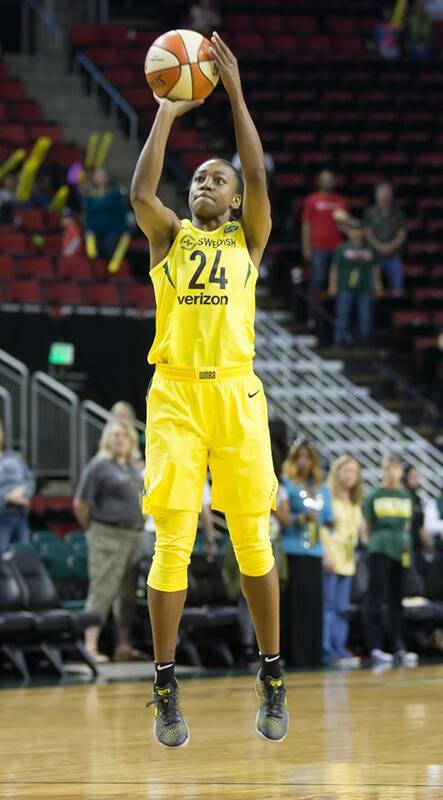 Canada broke the Pac-12 all-time career assists record in March, and finished her college career with 2,153 points, 831 assists and more than 300 steals. 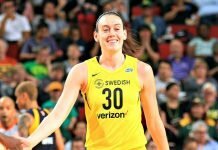 She will back up 16-year veteran Bird, but Hughes has indicated that at times, he’ll put both on the court at once. It isn’t hard to understand why. In two preseason games, Canada averaged 16 points, three assists, three steals and three rebounds off the bench. Both the franchise and individual players have been effusive with praise since Canada got to training camp, and it appears the sentiments are mutual. All four player additions are expected to improve a defense that finished in the bottom third of nearly every major statistical category in 2017. Hughes has made defense the focus since the first practice. The difference between good and elite may also come from the existing core, as Stewart and Loyd enter their third season as teammates. The two provided the bulk of Seattle’s scoring punch last season — combining for nearly 40 points a night — and will again shoulder much the load on offense. But Loyd suggested there’s more in store from the young duo. Jewell Loyd with the jumper. Neil Enns/Storm Photos. If there’s more to come from the back-to-back No. 1 picks, 25-to-1 odds may be just a bit too conservative.